This entry was posted in Uncategorized and tagged Unity, VMware, Workstation. Bookmark the permalink. I was pleased to read that unity is included in WS 6.5. I’ve linked to your site on my webblog, hope you don’t mind. Would you also know if the thumbnails that show when working with a team of VMs, will be changed? Make them floating, change them to left or right or even have them dissapear? I now often break a team, just because of this. On my wide screen laptop I have plenty of space on the sides, but not on the top of the screen to display them. I think it’s very unfair to give the idea that Fusion is an innovation of VMware. Parallels was there with Coherence earlier, and to my eyes, Fusion only copied a (very great) feature. But this is, of course, not to take credit off from the Fusion developers; you deserve it! Wonderful. VMWare truly leads the virtualization pack! Awesome! What other differences are there between Fusion and Workstation? As a non-commercial user, I find the $79.00 price for Fusion much more appealing than the $189.00 for Workstation. Does this mean that Player will also get Unity functionality? suk: I can’t say whether that’s happening for Workstation 6.x but it’s not unrealistic to expect that we’ll eventually have support for more guests. Gabrie: It’s possible to add support. I’ll check this week if there’s an existing feature request on this. anonymous: Sorry to give that impression. Yes, Coherence was first. Chris: No screencasts yet. I’m waiting until I have some changes in that will make this even more impressive. BenG: Definitely 🙂 Around beta 1 timeframe. Dylan: Well Fusion is for the Mac and Workstation’s for Linux and Windows. That’s the main difference. It depends on what platform you’re running. On top of that, Workstation has many developer-oriented features such as Teams, multiple snapshots, Replay, IDE support, clones, etc. The version of Player that ships with Workstation will have Unity support, but as for free Player, that is currently an unknown, but probably unlikely for the time being. How easy is it to extend support to other hosted environments? I would love to see it work for my current hobby play thing, Haiku. Consider this a manual pingback, since it didn’t seem to automagically work as intended. Great news! I’m waiting for Unity before I’m going to be upgrading my Workstation licenses. This is the virtualization killer feature for us as we migrate to Linux desktops. Ever heard of React-OS? It is a Win NT clone. It is open source and free. It is still in alpha stage though. I use Ubuntu and it is way better than Vista. About time you add this, since virtual box already has this. Hope it does not take long to have it in production. How does this work when no-one is logged on at the workstation? How does it work when someone is logged on through rdp? Is it coming to ESX? Matthew: I don’t know about ESX plans. This feature requires Workstation to be running. Adam: It’s a combination of FaviconizeTab, which shrinks the tab based on a URL regex, and PermaTabs, which turns it gold and ensures that those tabs are always there throughout the lifespan of the browser session. VMware Server is not a desktop product. It is designed to run VMs in the background, so my guess is that there is little chance that unity will make it to VMware Server. 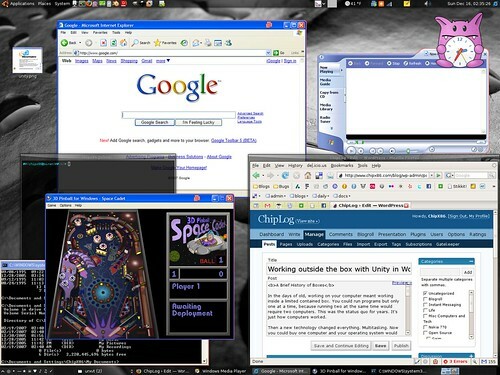 Can’t wait to run Linux/Unix applications outside of my Linux/Unix VM’s on Windows!! How is this “Unity” coming along? I’m dying to try this out. Is it out yet? Are you done yet? Are we there yet? This really is the killer feature for VMWare workstation! I really can’t wait to try it out.